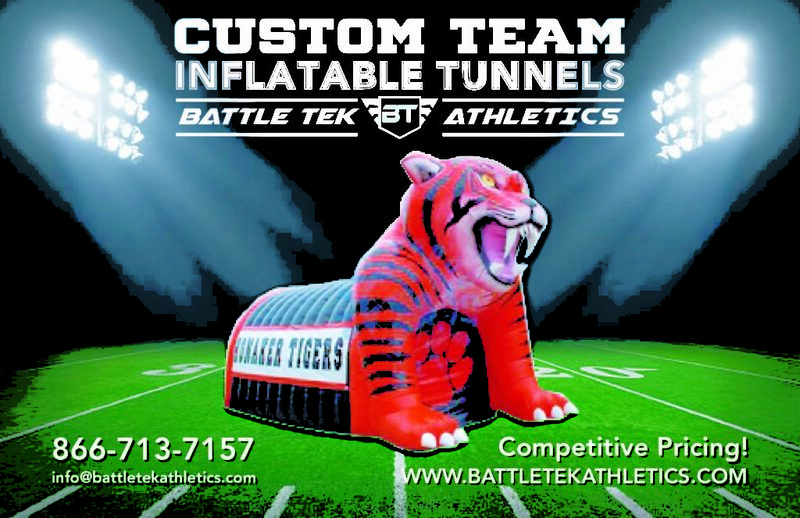 High school, college and now in the growing market are Youth programs; there are few things that get fans up on their feet faster than seeing their team burst onto the field through custom, inflatable sports tunnels. They are sure to get your fans roaring to go, while also psyching out the competition. Although most of our tunnels are for football, we can create any size tunnel (featuring just about any mascot) for any sport or function. Be sure to check out our inflatable batting cages or pubs. We use top-quality materials…heavy duty. Vinyl, not rip-stop nylon – our tunnels are built to last for many seasons of use, and come with a 2 year warranty on materials and workmanship. 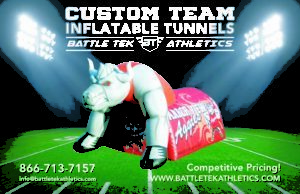 Custom Team Walkout Inflatables from Battle Tek Athletics. We are proud to offer you custom inflatable tunnels for your football teams to run through while getting introduced during each of your home games. 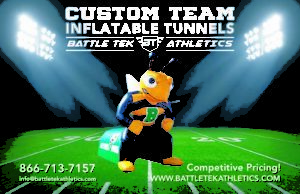 while being able to produce your inflatable tunnel that costs less than our competition. You might find a cheaper tunnel, but are they built with quality and care? Since our tunnels are so custom to your team, we ask that you call in for a unique quote! We work with many Booster Clubs, Youth Organizations and Coaches to provide a quality product that will increase excitement not only for your players, but the crowd, too! Our team of designers can create you a simple inflatable tunnel with a blast door on the front with your team logo, or we can design you a mock up of your mascot in full color and detail. 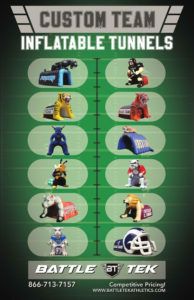 We can design and build any sports inflatable to fit your vision and budget. Call us now for a free quote and time-to-build-to-delivery timeline… Time to BUY NOW for the 2017 season! We are fast, too! The average time from design approval to delivery is about 4-6 weeks. 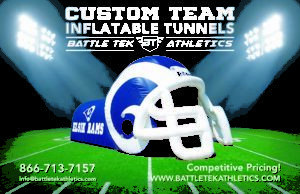 Tunnel Only -Pricing includes 1 standard color tunnel with Velcro door. 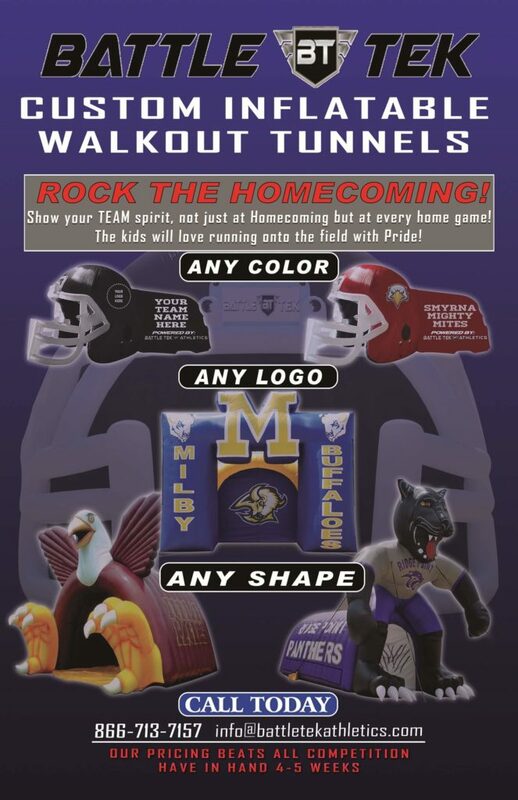 1 logo or name of your team on both sides of the tunnel. Upgrades available such as additional logo/printing or specific pantone color choices. 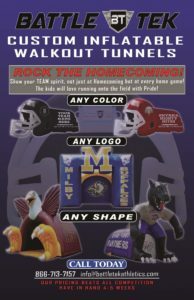 Helmet Tunnel – Choose helmet standard color, stripe color on helmet (if needed), tunnel color, face mask color, and 1 logo on each side of the helmet. 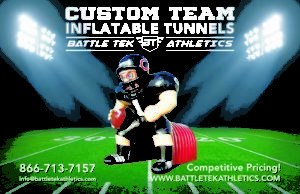 Logos can be added on side to enhance your tunnel for small upgrade fee. Upgrades available such as additional logo/printing or specific pantone color choices. Mascot Team Tunnels – Each mascot tunnel is custom created to fit your specifications. The detail of our tunnels is quite impressive, and our design team can design and build pretty much anything you can dream up. Allow us to provide you with a quote for these specialized, custom tunnels! Our overall goal is to get you an amazing product that will wow your team, your fans and your opponent, and do so at a reasonable price. 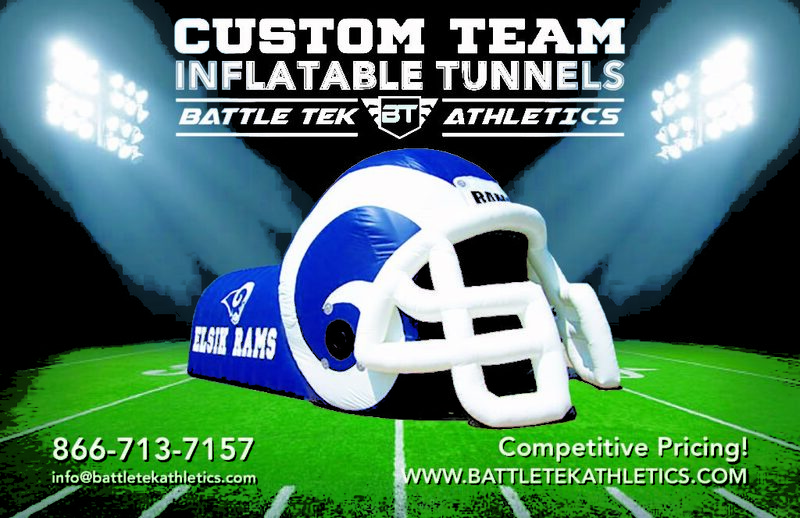 Battle Tek Athletics is now offering Commercial grade Inflatable Batting Cages!These cages are heat sealed and once inflated (which takes about 20 minutes) you simply replace the valve and turn off the pump. No need to keep continuous air blowing. Once done simply deflate, roll up and put away. Its just that easy! We make our cages with top quality materials, which are very durable. Our units are sold in 20 foot length sections and made so you can add more 20 foot sections to make 40, 60 or even 80 foot tunnels. The answer for every organization that needs extra cage facilities or would like to bring their cage with them on the road. These commercial grade batting cages are not just for the professionals or leagues, you can also use them in your own backyard. Unit Dimensions: 17W x 12H x 20L / Made from PVC Tarpaulin for both indoor and outdoor use. Recommending two that 2 sections be put together to create a 40 foot length cage. The ends have Velcro so they can be easily attached together, creating a safer area and more uses. All units come with the pump and repair kits.